The last 44 km to Nguigmi were sandy, although easily transited on reduced tyre pressures. Entering Nguigmi was like entering Fort Zanderneuf. We reported to the gendarmerie for our entry stamp, and whilst there they told us about Mudo, who was the local Mr Fix It. Mudo found us in the customs compound, and took it upon himself to get our carnet stamped. Although a large imposing fellow, he was very helpful, and spoke good English. There were no banks in the town, but we toured the market, and were able to change our CFA and some dollars into BCEAO (the equivalent of West African Francs). We were able to stock up on fuel and acquired a paeage ticket all the way through to Agadez (which was a real help at the checkpoints). 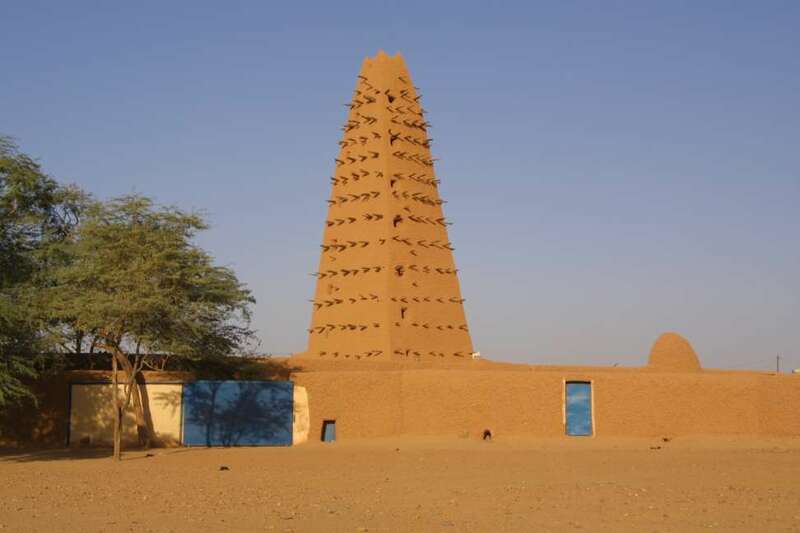 Mudo advised us as to the route and places to stay, and thought it possible that Algerian visas would be available at the consulate in Agadez. For these services he did not charge, although there was a healthy percentage within the exchange rates we negotiated. We were told the 670 km to Zinder were all tar, which was true, although the road between Nguigmi and Diffa was appallingly potholed with broken tar. 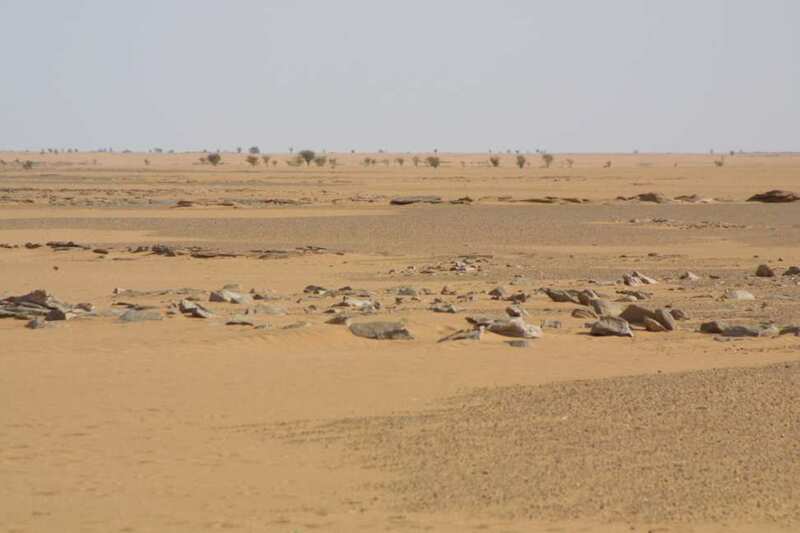 However the road from Diffa to Goure was excellent, but it deteriorated again for the final 166 km to Zinder as half the route was graded gravel with mild corrugations. It was a long slog, and we arrived just before sunset. We took Mudo's advice and stayed at the Hotel Damagaram in the centre of town. Zinder is quite a large town, and the BIA-Niger Bank advertised the use of credit cards, though we arrived on a Friday evening, and were not able to take this opportunity. In Niger, Saturday and Sunday are the weekend days, as in Chad, despite the dominant religion being Muslim in both countries. Although the hotel was expensive and not particularly comfortable, we were able to exchange dollars to pay our bill at the bank rate. We had to leave Daph outside, but we were just down the road from the police station, and there was a guard employed by the hotel to look after vehicles. Due to the price of the hotel, we cooked in the room using one of our multifuel stoves. We had not used these since trialing them in Pretoria, and Adrian nearly set himself on fire, although thankfully it was not serious. The following morning we went to register with the police but 'the man with the stamp' was not there (as so often seemed to be the case). We were told we had to wait until 10am for him to arrive, which was unacceptable to us. Eventually we spoke to a sergeant who said that as we already had a 'vu en passage' the stamp was not essential, but that it would be nice to show our friends that we had been to Zinder'(!!). So we decided to go without. 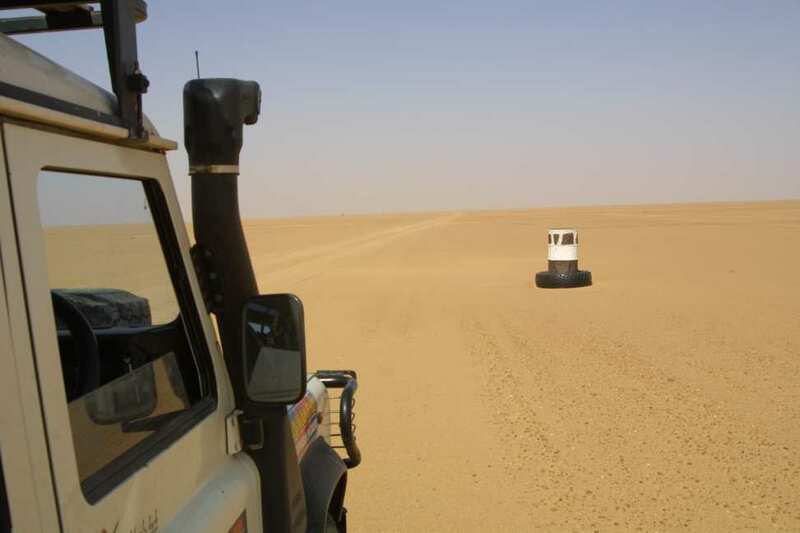 It was a 450 km drive to Agadez, over half of which is on tar, the remainder being light, graded sandy tracks. We completed the journey uneventfully in 4 hours. The scenery was sand and scrub, very flat except for the Falaise de Tiguidit, which broke the monotony. Initially, Agadez appeared a confusing town, but once orientated we managed to find the Algerian consulate quite quickly. Opposite, was the Pension Tellit, which we had read about previously, but thought it was in the main square. It transpired that there are two hotels of this name, the one opposite the embassy being out of town, cheaper and with secure parking. The staff were extremely friendly, and allowed us to stay, despite the fact that we did not have any local money until the banks opened on Monday. The two hotels and the Restaurant Pilier are owned and run by an Italian (Vittorio) who was in Italy at the time of our stay. 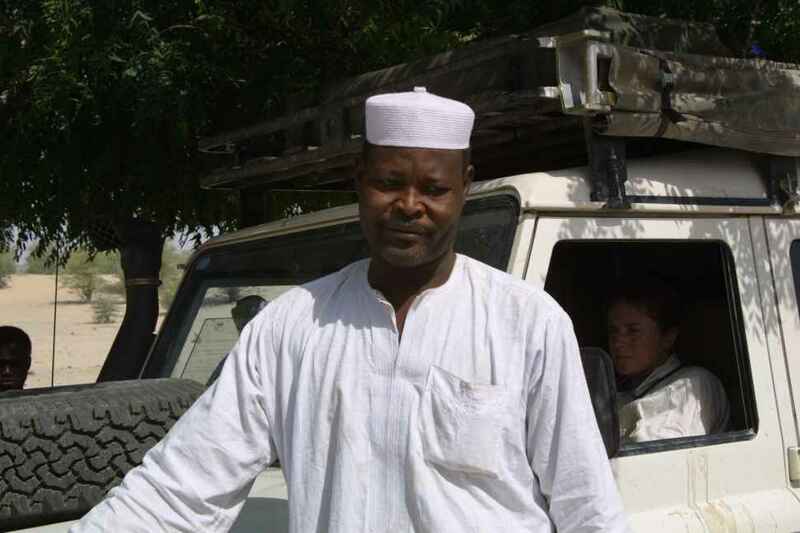 Moustapha, who appeared to be in charge, was very efficient and allowed us to eat at the restaurant on our hotel bill. Early the following morning, we went to register with the police, and whilst there we met 3 Swiss travellers, Peter, Barbara and Kasper, whom we arranged to meet later that day. Registration is free, although the policeman suggested a 'cadeau'. When challenged, he backed down and told us we could go. Next we went to one of the travel agents, Caravane voyages, to ask their advice regarding Algerian visas. They suggested that they send their representative to speak with the consulate in advance, on Monday morning, and we arranged to meet them at 8am. We spent a very enjoyable afternoon with the Swiss, sharing travel tips, for they were going the opposite way and had just come out of Algeria. 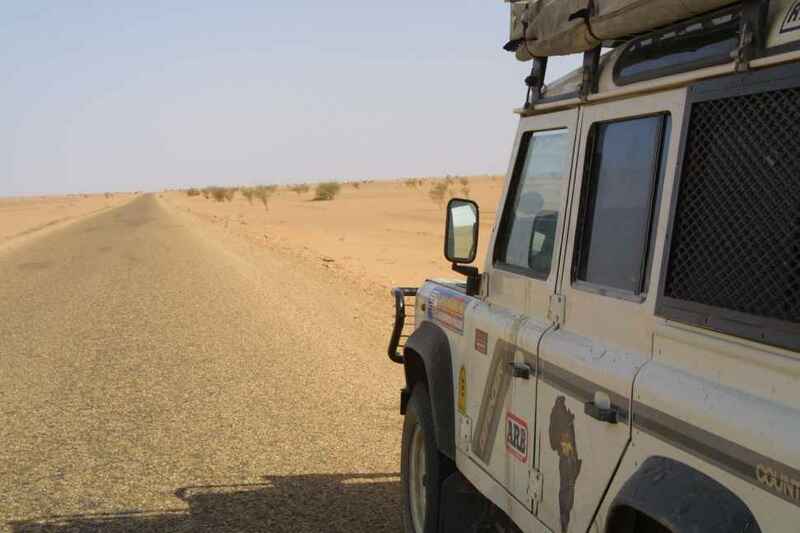 We borrowed detailed maps and GPS routes through Algeria. 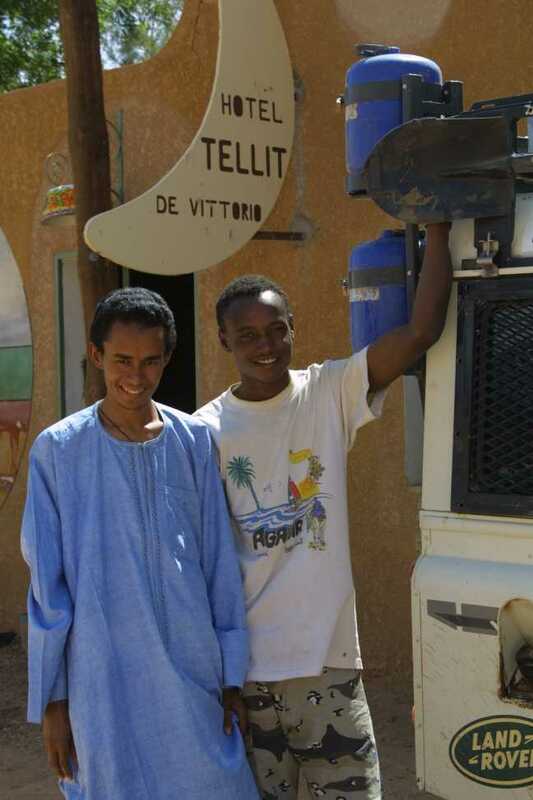 They thought that it might be difficult to get visas, and that we might have to go to Niamey. They had difficulty in obtaining their visas, which is common for most, although Peter had visited Algeria several times previously and certainly whetted our appetites. You can follow Peter and friends on his website (See Links Page). On Monday morning we went to the travel agent, and were told that their representative would speak to the consulate before we met again at 11am. We made sure that he understood that we were unable to apply whilst in the UK as we had been travelling for the past 7 months, as following the situation with the Libyan visa, we did not want to waste further time. We then went to the bank and were able to get a cash advance on Visa very easily - the whole process took less than 30 minutes. At 11am we drove to the Algerian consulate with the representative from the agent, and sat and waited for an hour. Just as the place was closing, we were ushered into the Consul's office. He was very brusque and business like. He understood that we were travelling, and that we needed to continue our journey, and was able to ensure that we obtained our visas quicker than we would get them in London. We were told to return at 5pm the same day. We could not believe our luck at this point, and expected to pick up the visas that day. On returning to the travel agent, they were delighted to have helped, felt confident that we would get the visas, and did not charge for their services. The agency can be contacted on tel: +227 440459, address: Caravanes Voyages, BP 240 Agadez, Republic du Niger. They operate out of Hotel Tchintoulous on the main high street. However, that evening when we returned to the consulate, they asked us some questions, wrote the information down and told us to return at 10am the next morning. Morale took a dive at this point. We knew that the hotel would be full on Tuesday night, but Moustapha said we could camp in the grounds if we wished, as we were already clients. The following morning we returned to the consulate. We were asked to pay CFA 44,000 francs in total, and we waited for around an hour, then were ushered in to a plusher waiting room where we met the Consul again. He presented us with our visas, shook our hands and wished us a bon voyage. Amazing! When we returned to the hotel we were told that one of the clients due that evening had cancelled, so we could stay in our room. The next morning we got up at 5.30, and left at 6.40. The journey to Arlit took less than 2 hours on a good tar road. Various officials wanted to see our passports and one persistent officer on exiting Arlit was desperate for a 'cadeau' and asked us for car insurance - a first for us in this part of the world (a little too late as we were leaving Niger!). 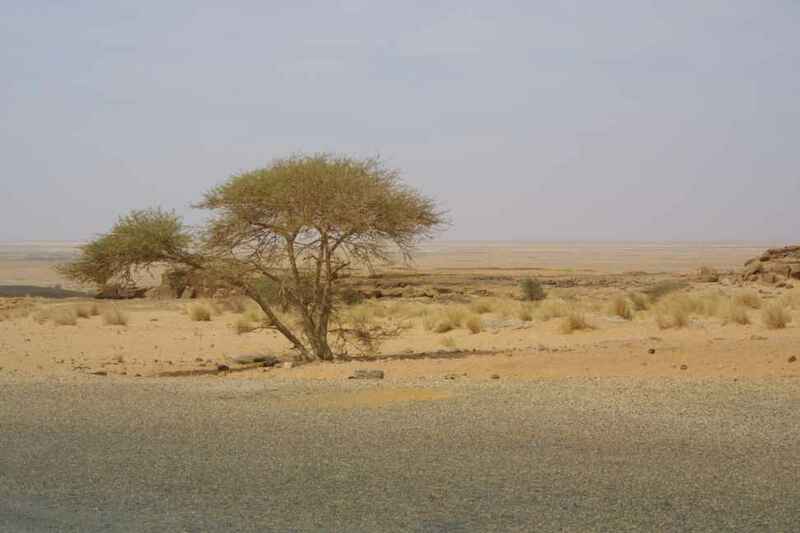 The road out of Arlit was a sandy piste, and we could only travel relatively slowly, at speeds of between 60 and 80 km/hr. The GPS came into its own here, as often the tyres or oil drums marking the route deserted us for stretches. Perhaps in hindsight we sould have reduce our tyre pressures, to assist with the occasional patches of very soft sand, but we managed to maintain momentum sufficiently well without. We reached Assamakam, which was a non-descript, almost deserted and extremely sandy village with various empty buildings half filled with sand and rubbish all around. The customs and immigration buildings were not immediately obvious. In the event, the customs process was easy, but immigration were irritating and wanted to see our driving licences. We weren't sure why, as we were exiting Niger, but we did not argue. The immigration office was a room consisting of three beds, one of which was occupied by an officer who was woken up to log our driving licences, and a desk at which two other officers sat. There was graffiti all over the walls. A money changer kept hassling us to change our dollars (we eventually found out he was offering a better rate than in Algeria!) but we olny exchanged our remaining West African CFA for Algerian Dinar and another guy tried to sell us diesel by telling us we could not get any at the next village (which we knew was not true). Anyway, fuel in Algeria was much cheaper and we wanted to hold out till we got there. The Michelin 954 1:1 million was surprisingly accurate. The 'Africa on a Shoestring' was equally useful for the city/town maps of Zinder and Agadez. Our Quo Vardis GPS coords were very basic and not required, but we did not vernture into the Tenere or Air mountains - we used the reasonably well maintained roads through Niger. Both Niger and Chad are relatively poor, former French colonies, although we found them to be totally different in character. We found the people we met in Niger much more soft and gentle, and many actually tried to speak English to us. We did not feel particularly threatened, despite the general level of poverty. 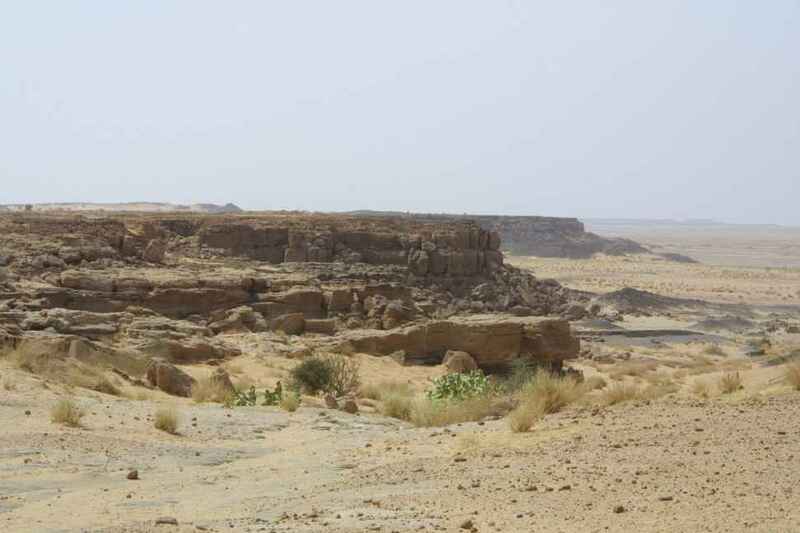 However, we did not visit the Air mountains or the Tenere, and neither did we go to the equatorial south of Niger around Niamey. 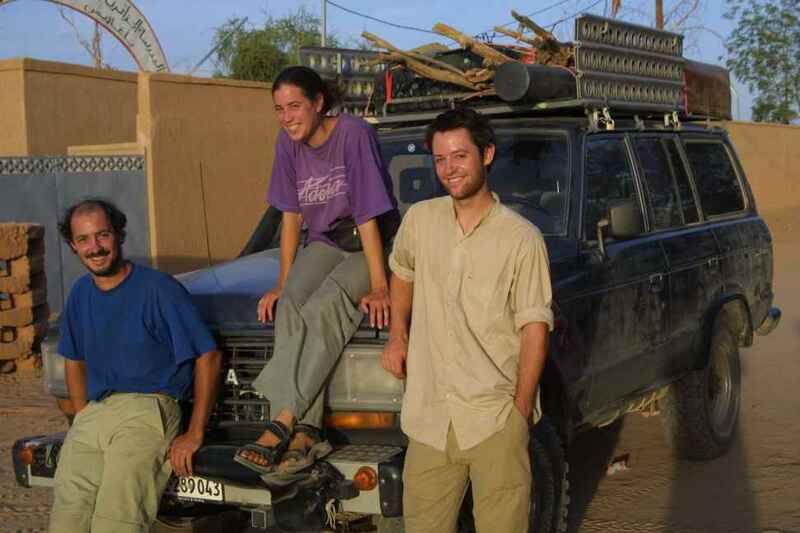 In Agadez we were struck by the large number of European package tourists, mostly French and German. They were taking trips to the Terene and Air mountains. This seemed strange to us as all the other westerners we had met since Kenya were either aid workers, travellers like ourselves or business people.